The dust has settled on our first day at the New York International Auto Show and there really is just too much to cover. So we’ve decided to focus on today’s highlight, the world premier of the 2013 SRT Viper GTS. Ralph Gilles, President and CEO of SRT, was on hand for such an occasion. 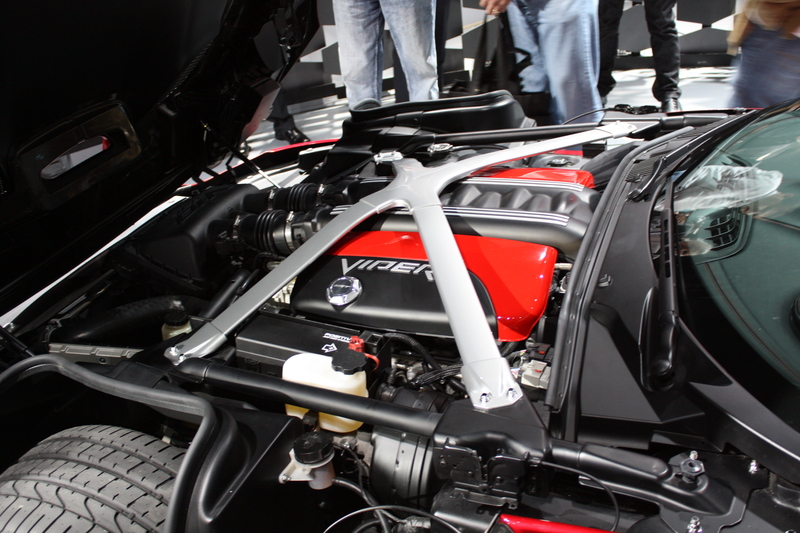 He quickly settled all of Viper Nation’s worries with an in-depth comparison to the 2010 model. The new 8.4 liter naturally aspirated V-10 is 28 lbs. lighter than its predecessor. It also gains 40 more horsepower and 40 more ft-lbs of torque (640 hp and 600 ft-lbs in total). In addition, new materials lower the total body weight by 32%. An optional track package lowers the total curb weight to 3,297 lbs. The combinations of less weight and more power place the new SRT Viper GTS 3rd best in the “dry” horsepower to weight ratio, only behind the phenomenal Bugatti Veyron and newly released Ferrari F12. The Lamborghini Aventador and Corvette ZR1 round out the rest of the top 5. It’s a fairly prestigious list of supercars, and we were impressed. 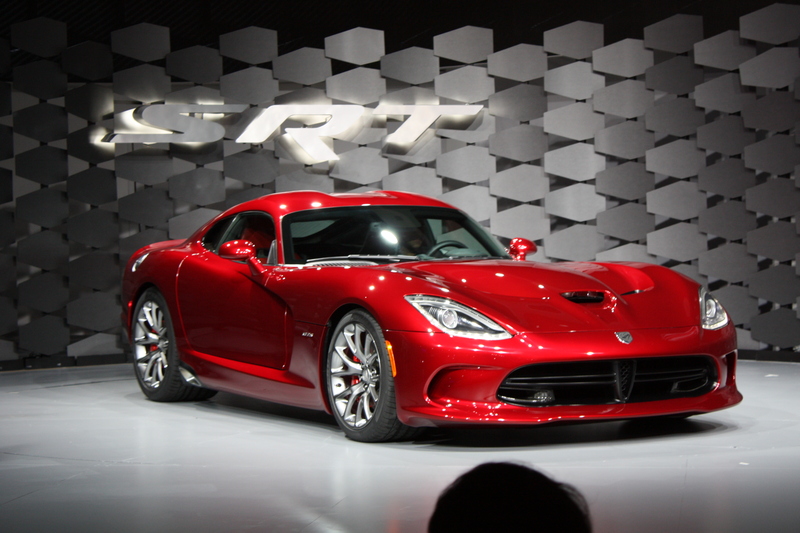 The SRT Viper will be offered in 2 trims, the SRT Viper and the upgraded GTS. The later gets upgraded wheels as well as some creature comforts, such as power seats and leather interior trim. With the technical bit out of the way, it was time to be presented with the new car. With a roar, the new Viper GTS rolled out onto the stage. Our first impression? It looks brilliant. The car is instantly recognizable as a Viper, but has grown more menacing and high-tech. Adjustable suspension, launch control, and multiple traction control settings bring the Viper well into the 21st century. This is also the first Viper with cruise control…can you say daily driver? Intake vents replace the classic hood louvers on the GTS trim; however the SRT Viper still retains the classic Viper hood look. Vents are present throughout the car, funneling and extracting air where it matters most. The car also retains its classic side exhausts, albeit with a new design. The tires, now made by Pirelli, have grown to a whopping 295mm in the front and 355mm in the rear. Once we got up close, it became clear that the new GTS was built with a new level of quality in mind. The seats, sourced from the same manufacturer used by Ferrari, are covered in leather. 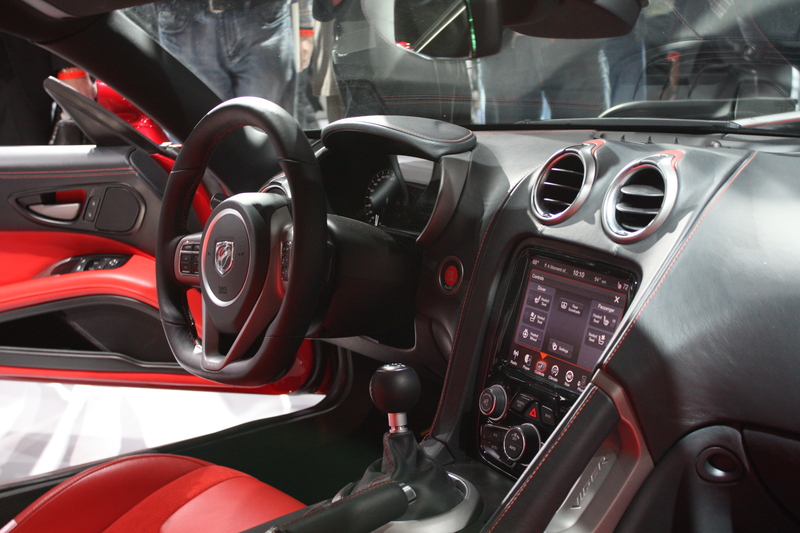 The interior surfaces get a similar treatment, with contract stitching and aluminum trim as accents. The thick, flat-bottomed steering wheel sits in front of a 7 inch gauge cluster display. One special feature is integrated shift light. As red-line approaches, the Viper snake begins to glow red. Without any drive time, it’s difficult to say if it will be effective, but we’re sure it won’t matter. The on-paper improvements and dynamic new styling have pumped some venom back into a company that has struggled to re-emerge from the flames. I love how the underhood scene of the Viper has hardly changed at all. That cross brace sure is beautiful though; did they have handling numbers? Not sure what you mean by handling numbers. What are you looking for? I was hoping to know if they had something along the lines of skidpad numbers, 60-0, 0-60, etc. Unfortunately, SRT has been very tight-lipped about any actual performance data, but if the new “dry” weight to horsepower ratio is any indicator, this should be the best handling Viper yet.